The origins of the Anthozoa lie in the Precambrian, but concrete evidence is sketchy. A number of the Vendian, or latest Precambrian, soft-bodied "medusoids" are now thought to represent benthic polyp-like organisms. Some of the frondlike fossils of the time could represent colonial anthozoans similar to living "sea pens," Eoporpita is one such Vendian fossil that could be a single anthozoan polyp, and Charnia is a frondlike fossil that in the past has been linked with "sea pens" or soft corals. However, this issue has not been resolved to everyone's satisfaction, although some well-preserved frondlike fossils of the genus Charniodiscus from Australia may show spicules and individual polyps (Jenkins 1989). In any case, there is molecular evidence to suggest that the Anthozoa are the earliest branch of the phylum Cnidaria (Bridge et al. 1992). Cambrian-age localities with soft-bodied organisms preserved also include some soft-bodied sea anemones and "sea pens," such as Mackenzia and Thaumaptilon from the Burgess Shale and Xianguangia from the Chengjiang biota of China. A few of the Cambrian "small shelly fossils" are spicules  nearly microscopic, mineralized, needle-like pieces  that appear similar to the spicules of living octocorals (Bengtson et al. 1990). A few mineralized corals and coral-like organisms also appeared as early as the Lower Cambrian (e.g., Sorauf and Savarese 1995; Tynan 1983). A minor group of corals, the Cothoniida, is known from the Middle Cambrian. However, it was not until the Ordovician that mineralized corals became important parts of marine ecosystems. By the middle of the Ordovician, several lineages of corals had become distinct: the Tabulata, the Rugosa, and the smaller Heliolitida. 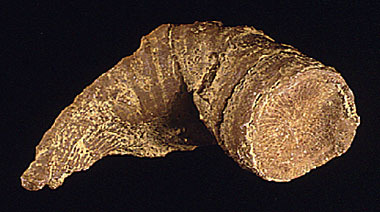 The best-known rugose corals are the "horn corals," solitary polyps, usually with a conical or horn-like shape, that are abundant at many Paleozoic localities (such as the large Middle Devonian fossil Heliophyllum pictured at the top of this page). However, all three groups of corals could and did form massive reefs. Heliolitids went extinct in the late Devonian, at the time of a mass extinction event that also impacted the Rugosa and, to a lesser extent, the Tabulata. However, these two groups soon recovered and flourished until the end of the Permian. Both tabulate and rugose corals disappeared in the Permo-Triassic mass extinction about 245 million years ago. In the middle Triassic, a new clade of corals appeared, the Scleractinia. The Scleractinia do not appear to be close relatives of either the Tabulata or the Rugosa, and probably evolved from sea anemone-like ancestors that have not been preserved as fossils. Like earlier corals, the scleractinians soon evolved massive colonial species that formed great reefs. 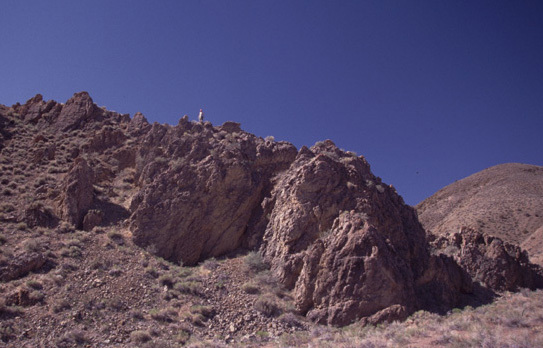 The image above shows an early scleractinian reef, now a massive limestone layer preserved in Dunlap Canyon, Nevada, near the town of Mina. 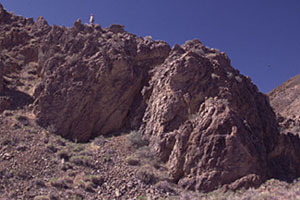 (Note the person standing on top for scale.) Colonial scleractinians have continued to dominate most tropical reef habitats since the Triassic, while other scleractinians live as solitary polyps in a wide range of habitats. The fossil record of octocorals is sparse. As mentioned, there are some Cambrian fossils that indicate their presence. There are also a few Paleozoic fossil "sea pens" and "sea fans" (e.g., Bengtson 1981; Glinski 1956). However, most of the known fossil octocorals are Cretaceous and Cenozoic in age (e.g., Deflandre-Rigauld 1956; Kocurko 1993). Fossil octocorals may be more common than is usually suspected, but probably go unrecognized when found. Bengtson, S. 1981. Atractosella, a Silurian alcyonacean octocoral. Journal of Paleontology 55:281-294. Bengtson, S., S. Conway Morris, B.J. Cooper, P.A. Jell, and B.N. Runnegar. 1990. Early Cambrian fossils from south Australia. Memoirs of the Association of Australasian Palaeontologists 9:1-364. Bridge, D., C.W. Cunningham, B. Schierwater, R. DeSalle, and L.W. Buss. 1992. Class-level relationships in the phylum Cnidaria: evidence from mitochondrial gene structure. Proceedings of the National Academy of Sciences of the USA 89:8750-8753. Conway Morris, S. 1993. Ediacaran-like fossils in Cambrian Burgess Shale-type faunas of North America. Palaeontology 36:593-635. Deflandre-Rigaud, M. 1956. Les sclèrites d'alcyonaires fossiles. Élèments d'une classification. Annales de Palèontologie 42(4):1-24. Glinski, A. 1956. Plumalina conservata n. sp. (Gorgonaria) aus dem Mittel-Devon der Eifel. Senckenbergiana Lethaea 37:53-57. Jenkins, R.J.F. 1989. The "supposed terminal Precambrian extinction event" in relation to the Cnidaria. Memoirs of the Association of Australasian Palaeontologists 8:307-317. Kocurko, M.J. 1993. Eunicella sp., octocorallia from the Red Bluff Formation, lower Oligocene, Mississippi. Tulane Studies in Geology and Paleontology 26:35-40. Sorauf, J.E., and M. Savarese. 1995. A Lower Cambrian coral from south Australia. Palaeontology 38:757-770. Tynan, M.G. 1983. Coral-like microfossils from the Lower Cambrian of California. Journal of Paleontology 57:1188-1211.